Plugins for 3Ds Max®, HDRI Skydomes, Real Trees I, Real Trees II, Real Shrubs, Real Flowers, Real Grass, Real Boulders, Real Fruits, Real Grounds and all Wall and Floor textures. REAL FLOWERS is a model library with 150 realistic 3d models of garden flowers. Each of the 15 flower species has 10 different variations. REAL GRASS is a grass model library with 122 3d models of grasses and flowers. Each plant specie has between 4-8 different model variations. REAL TREES is a tree model library with 60 realistic 3d models of mainly deciduous trees . Each of the 15 tree species has 4 different variations. REAL TREES II is a tree model library with 60 3d models of exotic trees from over the world. Each of the 15 tree species has 4 different variations. REAL SHRUBS is a set of 100 shrub models garden decoration. The library includes 10 species with 10 variations each, including fern, flowers, sedge grass, roses and many more. INTERIOR PLANTS is a set of 10 3d plant species for interior or exterior decoration. The library contains 40 highly detailed 3d models of plants in pots, to decorate shops, hotels, appartments and more. REAL FRUITS is a set of highly realistic fruit models and bowls for advertising or decoration in architecture, available as highres single models and fruit bowl arrangements. OMNITILES frees patterns from the chains of square tiles. With the pattern editor, you can create any shape and virtually unlimited types of patterns in 3Ds Max® or for use within game engines. WALLS & TILES is a very easy-to-use 3Ds Max® material that creates procedural walls and floors based on multiple single bitmaps. The included Walls & Tiles material creates a whole material in seconds. CROSSMAP is a 3Ds Max® shader that randomly distributes bitmaps on geometry (objects, elements, faces etc. ), for example leaves on trees, grass, gravel, stones, flowers, wood fences and many more. COLOR EXTRACT extracts up to 100 colors from any photo and randomly assigns them to objects, object elements or procedural maps. Just load any photo, extract colors and your material is ready. AUTOMAP with AUTOMATERIAL is a set of 3Ds Max® plugins that make material creation based on bitmaps a very simple matter. AUTOMAP extracts height maps, specular maps and diffuse maps based on photographs. MOSAIC is a very easy-to-use 3Ds Max® material that creates procedural mosaic walls and floors based on multiple single bitmaps by matching the average bitmap colors to the colors of a source map. COLOR COMBINE is a simple map to combine and add multiple maps per color channel. It´s simpler and faster than the composite map in 3Ds Max®, so if you´re looking for an easy RGB channel shader, this is it. The MATERIAL MANAGER is a new innovative tool to manage materials, maps and bitmaps within 3Ds Max® in ways never possible before. Search, load and save presets with ease and speed. REAL FLOORS is a bundle of 10 3D scanned floor textures and one old wall texture for architectural visualization or games. Each texture has been scanned via photogrammetry and reconstructed for a very high level of realism. The textures all have a size between 3 x 3 and 5 x 5 meters and can all be tiled seamlessly. Each set includes layers for basecolor (diffuse), ao (ambient occlusion), height (as jpg and exr), normal, roughness and reflection level. Standard Walls is a set of 20 highly detailed brick multi-textures licensed by the original manufacturer ROEBEN from Germany. Each texture set includes several brick variations with diffuse, bump, displacement, reflection and alpha-mask layers. A total or 230 individual bricks with 1.151 hand-edited bitmaps for Walls & Tiles, Crossmap or Mosaic. Stone Floors is a set of 19 highly detailed stone floor multi-textures of cobblestones, new and old square tiles for sidewalks, streets or house exteriors. Each texture set includes several stone variations with diffuse, bump, displacement, reflection and alpha-mask layers. A total or 193 individual stones with 949 hand-edited bitmaps for Walls & Tiles, Crossmap or Mosaic. Aged Walls is a set of 24 highly detailed old brick multitextures for architectural visualization. Each brick wall includes several brick variations with diffuse, bump, displacement, reflection and alpha-mask layers. The textures are perfectly prepared to create several types of old brickwalls for castles, villas or ruins with Walls & Tiles. Modern Walls is a set of 12 highly detailed textures for architectural visualization. The set includes fully tileable 4k textures (4096 x 4096) with diffuse, bump, displacement and reflection layers plus 12 sets of high-resolution individual bricks for use with Walls & Tiles, Crossmap or Mosaic. Plywood Panels is a set of highly detailed textures for architectural visualization. The set includes 10 individual textures (app. 4000 x 2000) with diffuse and bump+specular layers. The textures have a real-world size of app. 1,50 x 0,90 meters (4,9 x 2,95 feet) and can be used individually or in combination with Crossmap. Demo scenes for 3Ds Max® are also included. HDRI Skydomes contains all 40 panoramic 360° images in HDR and EXR-format to be used as spherical environment in 3D scenes. The exposure images were taken with professional Canon and Nikon cameras at locations in Germany and the UK. All images were manually adjusted and corrected with dust removal, alignment and chromatic abberation correction. Each hdri skydome has several backplates of the skies taken at the same time to be used as variations for the background. WINTER SCENE is 3Ds Max® scene, created by Igor Ilić using VIZPARK products, including Real Trees and one HDRI Skydome, specifically for VIZPARK customers. The 3Ds Max® scene for vray is free for everyone until the end of the year 2014 and will be included in all of the Bundle products beginning with January 1, 2015. The scene uses the HDRI Skydome 09 (slightly modified in Photoshop) and a bunch of trees from Real Trees (also partly modified to fit the winter scene). CASA NAVONA is the first VIZPARK 3Ds Max® scene, created with the help of VP products, including Walls & Tiles, Crossmap, HDRI Skydome 04, several textures and plants.The scene is a learning resource, a base scene for your own architectural project and simply put … a content bundle with VIZPARK textures, models and a hdri sky dome. The scene is inspired by real architecture from Ji Studio. *) VIZ plugins are only available for 3Ds Max® and therefore are excluded from VP Complete for C4D, MODO, LightWave, FBX and OBJ. **) REAL SHRUBS for Cinema 4D, LightWave and MODO is not available yet, but included in the purchase. These formats will be added later for free. You don´t need the full bundle ? The assets’ quality is very good and the prize a bargain. And on top of that: The customer service is a blast! This was one of my all time favourite transactions! High-end products that will make you more confident in delivering competitive visuals! GrowFX libraries are so cool. Worth every penny! Keep it up VIZPARK! if i buy grow fx version for “Vp complete” .Do i get Vray materials for it..? Yes, all our products for 3Ds Max or 3Ds Max with GrowFX include materials for vray. Our plugins don´t support vrayRT at the moment, but everything works fine with vray. how could i get black Friday discount ? do you have technical support for any issues ? The BLACK FRIDAY sale is still on and you don´t need any coupon. The prices are already discounted for all bundles, which you´ll see on the product pages and during checkout. And yes, we have technical support via our support ticket system. 1 – If I buy this bundle now, do I get any kind of update of the plugins? 2 – If I choose the GrownFX option, will I have everything compatible with 3ds Max? 3 – In cases of updating 3ds Max, would I receive the update of the plugins for the newest versions of Max? thanks for your interest in VP COMPLETE. 1 – Yes, all minor plugin updates are free (1.1, 1.2, 1.3 etc.). Major updates (2.0, 3.0 etc.) might cost something. So far in the past years we never had any major update, so it´s not happening very often. Usually these major updates will include bigger new features, so it will be worth considering. 2 – The GrowFX version includes all files from the 3Ds Max version for use without GrowFX. So you can use all files with 3Ds Max, but may use the GrowFX files later if you decide to buy the GrowFX plugin. 3 – Yes, new Max versions are supported for free. Hello, it’s me again, … I’m going to buy the bundle…but… I don’t find any option for Corona… is there one or does le 3DS Max format bundel (349 €) have every 3ds format inside? vray, corona, thea…etc? The 3Ds Max and GrowFX formats both include files for different renderers, Corona, vray, and more. For a detailed overview of the supported renderers per included product, please refer to the individual products. For Corona, all our models support Corona. Hello, I’m using 3DS 2016 with Corona 1.6.1. Is that all the plants and objects of the bundle, are in Corona 1.6 format? Great!! Thank you for these explanations. Ah, now I see what you mean, you mean if all models are Corona compatible (and not specifically 1.6 compatible), right ? That´s the case with these models and in case there are any that are not compatible yet, let me know. We strive for full Corona compatibility with all our tools and models. You said compatible … so you’re well agree that all models are already in Corona format? I already have enormous objects coming from Vray that I have to convert. I’m looking for objects usable directly in Corona. If this is the case, I think buy this bundle. All models are compatible with Corona, but not all are optimized for 1.6. They should work fine with 1.6 though even if some parameters are not adjusted. Hello, Is the VP Complete Bundle compatible with max 2017/vray? Does the shader plugin for 3ds max works with vray? Yes, VP COMPLETE is compatible with Max 2017, but we know if an issue with the viewport in Max 2017 on Windows 10, which we try to solve together with Autodesk. If you have this configuration, I´d recommend to test our PLUGINS COMPLETE – Demo first to see if this works on your system. The models and textures are not affected by this, just Walls & Tiles and Mosaic. Hello, I am interested in buying the VP Complete Bundle (and with the attractive X-mas discount even better!). I am modeling mostely in Rhino 3D. Sometimes I am rendering within Rhino with the Rhino Render, Maxwell Render or iRay and sometimes I am exporting the models to Modo to model or render. What would be the best bundle to buy to cover most of the programs. Can I use the modo model and textures in Rhino? PS: Great models and results with your textures. Thank you. Thanks for your interest in VP COMPLETE. If you use different 3d applications, your best choice would be VP COMPLETE – STUDIO, since this includes ALL formats that we have and also multiple licenses for the plugins. This would give you everything we have for any format that we support. I’m an architectural visualizer since 20 years now, still love the work. Always happy these days when there is some landscaping involved! Your models are brilliant, I’m waiting for some slack in the workload to play around with them for sheer fun. This is a fantastic collection. The HDRI skydomes are excellent in lighting your image. I really love the Real Grass and Real Trees models. They really help to dress up the scene and give it more life. I purchased the MODO bundle and was able to esily integrate it with Vray for MODO as well as Octane Render. Keep up the great work. Super to get native and affordable high quality content for my favourite 3D software, hoping in the future for a conversion of the material to other LightWave3D renders too. High quality product and very good integration with MODO. Thanks a lot! I’am using Sketchup and Thea Render? Can i also use this bundle? I could provide you with the FBX or OBJ version, but we don´t have a native Sketchup version yet. We are working on the conversion of the models and hope to release them not too far away. If you are interested in the FBX or OBJ version, please send a support request and I´ll arrange something. VP products are developed with the Highest Quality control. Their flexibility to smoothly run on several 3D platforms take them to be State-of-the-Art solutions for your Architectural Visualization endeavors. VP has made my Rendering tasks a lot easier by providing intuitive tools that add an Innovation and Beauty to my Architecture projects. Congratulations to the VIZPARK team for being such a Customer-Centered people. Loads of quality HDRI skydomes, textures and models, together in one epic affordable bundle! is this 3ds max format only or is there modo and c4d inside this bundle? The current version includes mostly 3ds Max files, but I´m planning to release a C4D, MODO and LightWave only version soon. If you want to buy now, I will one other format to your downloads and if you´re interested in the full bundle with all formats, please send me a message through contact or the support form. Excellent value, top-notch models and textures. A significant addition to our company’s production pipeline! Everything in this bundle is top quality and a must-have in anyone’s workflow. These are my favourite skies and I am constantly using the shader plugins in my work now. You couldn’t ask for more from the plant models, either. The support is fantastic. VIZPARK is a company with integrity who always takes care of people. Don’t go anywhere else; spend your buck right here. VP Complete helped me introduce a lot of extra variety to my archviz works in almost no time. The quality is top class and the price is excellent. A must-have for all archvizers! Support works perfectly, which is very reassuring – VIZPARK is a brand you can trust. Top Product in all belongs ( Quality, Performance, Stability ). Works great, also in a distributed Render-Environment. Support is also excellent. 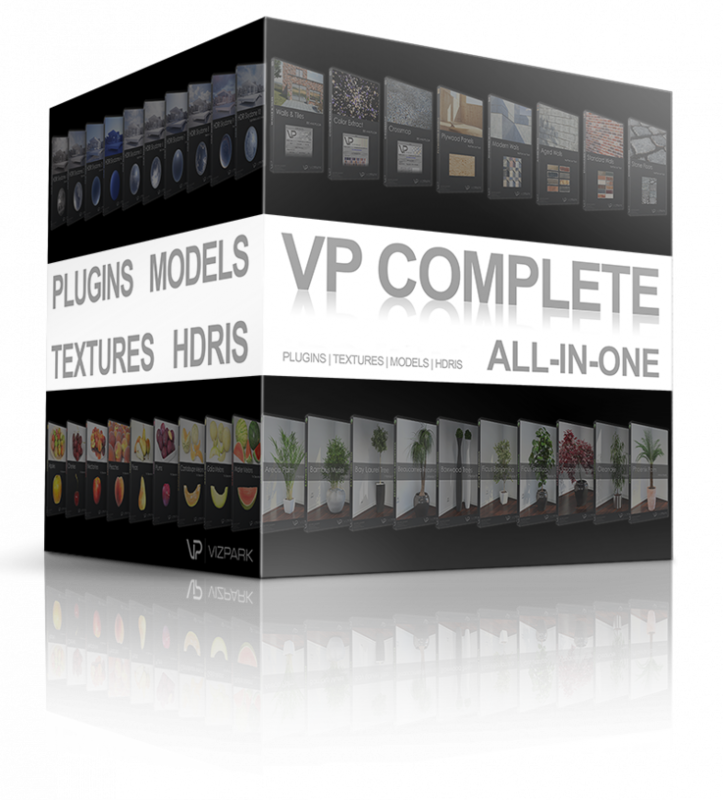 VP Complete bundle is absolutely the best value-for-money deal avaliable on the market now. It’s a great package for small archviz studios, it gives them the ready-to-go kit for creating almost anything. The support is also great.